New York, NY – June 1, 2018 – Following a banner year which included seeing his debut album, There’s Really A Wolf, be certified Platinum by the RIAA; two monster performances at Coachella and a forthcoming performance at Governor’s Ball, platinum selling recording artist and producer Russ will now bring his creativity to a merchandise collection, sold exclusively at Urban Outfitters. 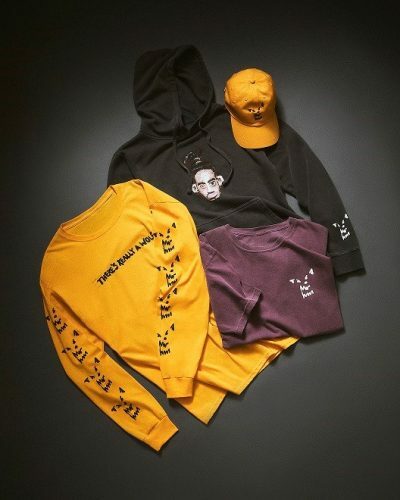 Beginning June 1, the limited edition collection of Russ merchandise, featuring design by Kid Super, will be available at select Urban Outfitters across the country; it will also be available at UrbanOutfitters.com starting on June 4th. Fans will be able to purchase a range of apparel and accessories including t-shirts, sweatshirts, caps and keychains. Prices range from $12 to $64 USD. In honor of this exciting announcement, Russ will make a special appearance at the Urban Outfitters in SoHo in New York City on June 3rd. Beginning Friday, June 1st, the first 100 fans to purchase the merchandise at Urban Outfitters SoHo location will be able to attend a meet and greet with Russ on June 3rd at the Urban Outfitters SoHo location. To download product imagery, click here. To shop the collection (starting June 4th), click here. Urban Outfitters is a lifestyle retailer dedicated to inspiring customers through a unique combination of product, creativity and cultural understanding. Founded in 1970 in a small space across the street from the University of Pennsylvania, Urban Outfitters now operates over 200 stores in the United States, Canada and Europe, offering experiential retail environments and a well-curated mix of women’s, men’s, accessories and home product assortments. For more information visit Urban Outfitters at urbanoutfitters.com.